I'm on a mission to add more houseplants to our home this summer and since I want them to actually live, easy-care tillandsia (air plants) are a perfect addition to our plant window. There are many cool-looking varieties of tillandsia, and you can put them pretty much anywhere since they don't need soil or a pot to survive, just light and air (that's where they get their nutrients). I have a little display of embroidery in hoops up on a wall near our plants, and I thought that attaching air plants to some pretty fabric in an embroidery hoop could potentially be really cute. I took pictures of the process as I made it so that I could share a tutorial here. It was really easy and quick and I'm so happy with how it turned out. Yay houseplants! 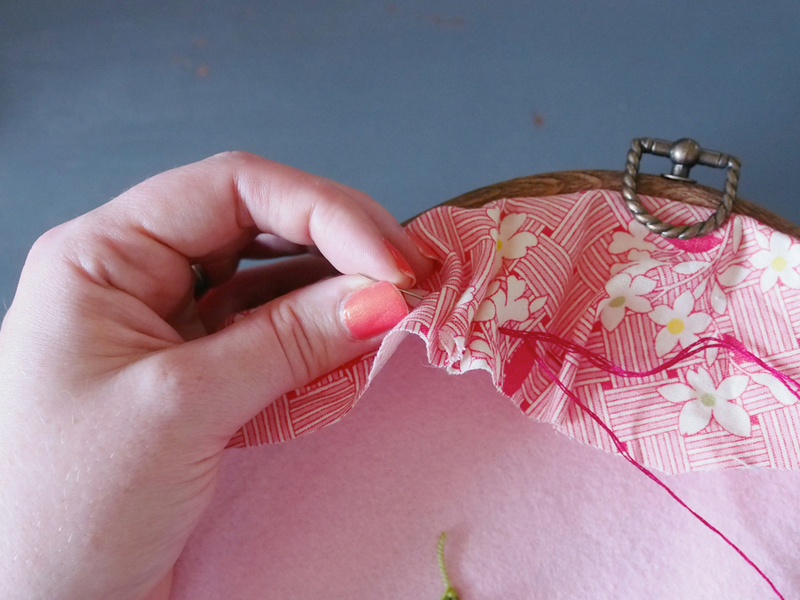 Place your fabric in the embroidery hoop and stretch taut. Make sure you have a couple of inches around the outside of the hoop on each side for finishing nicely later. Decide on the placement you want for your air plants and note a spot on the fabric that you want your yarn (which will hold them in place) to come through. Enjoy how cute it looks already! Thread 1 yard of yarn through the tapestry needle and push through the felt and fabric in the spot you noted earlier, where your first plant will go. Leave a 6" tail on the back side of your hoop. Tie a slip knot around your crochet hook on the front side of the hoop and fabric, and pull it tight and close to the fabric. Crochet a chain just long enough to make a loop that will hold your air plant in place. You want the air plant to be able to really sit in there securely, but this won't take many stitches - for my bottom air plant I chained 15 stitches and for the top, 8. When your chain is long enough for your plant, pull your remaining yarn through the last chain loop and tighten it off. Thread the remaining yarn tail through your tapestry needle and draw it back to the other side. I recommend pushing through the fabric right next to your first hole, and then using the same felt hole in the backing. Then, tie the two tails together securely in the back - I tied mine 4 times to make sure that the knot was big enough that it wouldn't slip through the backing. Repeat steps 4 - 8 for your second plant. Now you have two cute little loops! To finish your hoop for hanging, first trim the fabric so that you have a nice even 2" or so around the circumference of your hoop. Thread your sewing needle with 3 strands of embroidery floss and turn the hoop to the backside. Work a loose running stitch around the entire circumference, about 1/2" from the edge of the fabric, pulling tight as you go. When you've gone around the entire circumference, make sure the fabric is pulled securely and evenly to the inside, and secure the end of your embroidery floss. I'm going to wait for a month or so to make sure that the plants aren't weighing down the fabric and causing it to sag in front. It they do, I'll just keep my eye on it and pull the fabric tight every so often. If the fabric stays nice and taut, I'll cut another oval of wool felt to cover this backing so that it's nicely and completely finished. Now all you have to do is place your tillandsia in their loops, hang up your cute new air plant embroidery hoop display in a nice sunny spot, and enjoy! The air plants just pop right out of their yarn loops, which means I'll be able to easily take them out to mist and water them as needed - I'm not planning on misting them while they are in the display as I don't want to get the fabric backing too wet. I definitely plan to add more of these to hang here by this window; adding houseplants and displaying pretties from my fat quarter collection at the same time is such a win! If you make one of these I'd just love to see a photo, so please share a link in the comments or @ me on Twitter or Instagram. The nursery where I bought these plants (Jericho Nursery, for locals) said not to use chlorinated water, and that other than that they are very low-maintenance and can live for many years. I hope to have these little guys on our wall for a long time!